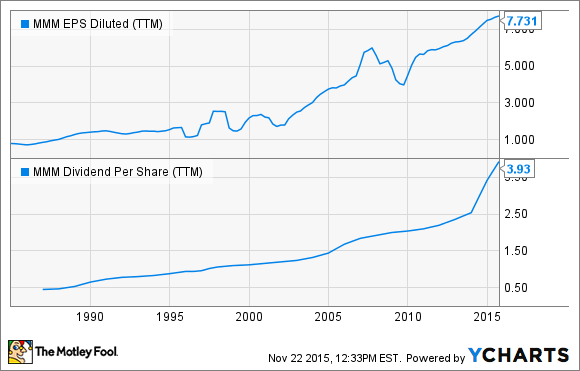 Is 3M Masking a Bigger Problem With Share Buybacks? 3M may be masking bigger problems by spending billions of dollars on share buybacks. There's a lot of pressure on public companies to grow earnings for shareholders, and sometimes that can lead to some financial maneuvering that may not be in the best interest of a company long term. 3M (NYSE:MMM) may be falling into that trap after being one of the most stable companies on the market, growing earnings and dividends consistently for decades. MMM EPS Diluted (TTM) data by YCharts. Lately, there may be some flaws in 3M's business that are being masked by share buybacks that boost earnings per share without growing earnings as a whole. The company is funding those buybacks with debt that could make it a riskier company if operations don't turn around in the future. Like most U.S. companies with a large percentage of sales overseas, 3M has seen sales and earnings fall significantly in 2015. In the third quarter, sales fell 5.2% despite growing 1.2% organically because of a strong dollar that makes foreign sales appear weaker. As a result, net income fell 0.5% as well. But earnings per share rose 3.5% because the company spent $5.38 billion on buybacks in the past year. The buybacks have artificially boosted earnings per share, and it's starting to put a strain on the company's balance sheet. In the last year, 3M has paid out $2.47 billion in dividends on top of the share repurchases. In total, $7.86 billion has been returned to shareholders. But over that same timeframe, the company has made just $4.76 billion in free cash flow. And cash flow is down 10.8% so far this year. Without sufficient cash to pay for share buybacks and dividends, 3M has had to use debt to provide the needed cash. In the last year, debt has increased from $7.34 billion to $11.3 billion. Increased leverage on the company could put stress on the balance sheet long term if 3M's growth doesn't pick up. You could argue that 3M is wisely taking advantage of low interest rates to buy back shares and pay dividends to shareholders. A company with around $4 billion in ongoing annual free cash flow can easily handle $11.3 billion in debt. If management is opportunistically buying undervalued shares with debt, it could pay off long term. But the flip side is that organic growth numbers are anemic, and unless the dollar weakens significantly, the company could see sales fall again in 2016. And it's hard to see how shares could be significantly undervalued at 21 times earnings now that earnings are in decline and organic sales growth is just 1.2%. If management gives in to the need to increase dividends and earnings per share, we could see further cash drain and leveraging of the balance sheet. It's a vicious cycle unless either operations pick up or buybacks slow down to bolster the balance sheet. And neither seems particularly likely at the moment. My fellow Fool Morgan Housel has highlighted over and over again that corporate managers are notoriously bad at buying back shares opportunistically, and they often overpay for shares, using buybacks to boost earnings per share in the short term. In 3M's case, the billions being spent on buybacks are masking weakness in the company's core business and could add leverage at exactly the time management should be focusing on bolstering the balance sheet and investing enough in R&D to grow revenue organically and not at a level that's just enough to maintain existing products. Long-term, investments in R&D would likely add more value to shareholders than buying back shares to boost earnings per share. It's worth keeping an eye on whether growth funding picks up in the future or whether buybacks are a new trend being used to cover up slow growth. If it's the latter, it could be a sign of decline for this industrial giant.